“Like many other women, I still had visible effects of – in my case – two pregnancies which had spread mainly on my belly and hips. Losing weight clearly is a matter of attitude. If you really want it, you can do it. However, to lose weight at desired areas is a challenge that is not just a matter of will. I’ve more or less always been a sportive person. But somehow I felt a bit powerless in this case. At the end of the summer of 2016, I had come to the stage where I finally wanted to do something against this stubborn fat pads on my hips and belly and I was searching for a combination of healthy nutrition and targeted exercise. Plus, I was looking for someone who would guide, control and motivate me. Having made up my mind I didn’t have to search for long, as I was told by a friend how marvellously she was able to shape her body by relatively little effort. I was really amazed how her figure had changed so quickly by exercising and controlled nutrition so everything became much tighter. Needless to say, I really wanted that too! 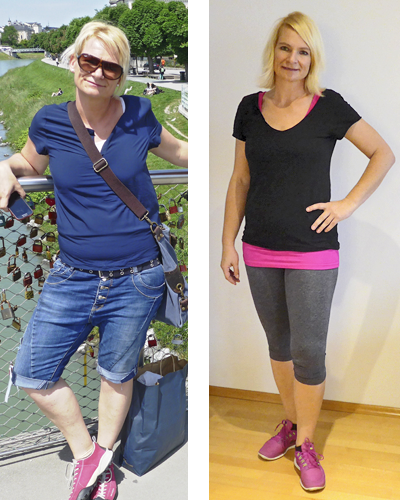 No sooner said than done – I had my first test training at the HYPOXI-Studio Dornbirn (AT) with Silvia who afterwards greatly consulted me and coordinated my nutrition with my individual needs. I left the HYOXI-Studio in total euphoria and I knew this was mine! The studio atmosphere was so pleasant and calm. The needed time of 30 minutes per training three times a week is very low and the physical effort is moderate. This training can also be carried out by untrained persons – it depends on the pulse which is constantly observed. Within the first 2 weeks I lost 4 kilos, which of course was extremely motivating. Everything settled so well and my kilos dropped – not as fast as at the beginning stage – but I reached my first goal of losing 10 kilos by Christmas. However, what was much more important to me was the many centimetres of circumference which I had lost mainly on my belly and hips, exactly at the desired parts. The stubborn fat on the belly was reduced relatively quickly compared to the fat pads on my hips, which had stuck there for so much longer. Silvia predicted to me about 2 months later that the nasty fat pads at the hips would be next to change. I must admit that I was sceptical about this, but Silvia turned out to be right! At first, I couldn’t believe it, but the change came all of a sudden and my figure really turned out to be different! Everything suddenly looked firmer – the silhouette simply nicer. For a long time now, I have felt great again with myself. Well, that’s the current state – and now the training for the summer figure can start, as in summer there are no long coats and wide jumpers to hide the body! Go ahead and fight the nasty fad pads too – visit HYPOXI. Finally, I would like to point out that I never would have thought of reporting my figure change experience publicly. But finally, I was one of so many women in search for the perfect method to lose weight – and even more important – to shape the body. So I know that one is grateful for any good advice. Therefore I had to do it now. This method is absolutely effective. If, besides the regular training, you stick to Silvia’s nutrition guidelines, nothing can go wrong!